We’re excited about the release of Arthur Dawson’s “Where the World Begins: Sonoma Mountain Stories and Images,” and proud to have played a role in the making of this beautiful book in collaboration with Dawson, Sonoma Mountain Preservation and other area nonprofits and agencies. Dawson is a historian, a longtime Glen Ellen resident and a longtime friend of ours, so we were happy to contribute our own knowledge and experience of Sonoma Mountain, and to help sponsor and promote the book. 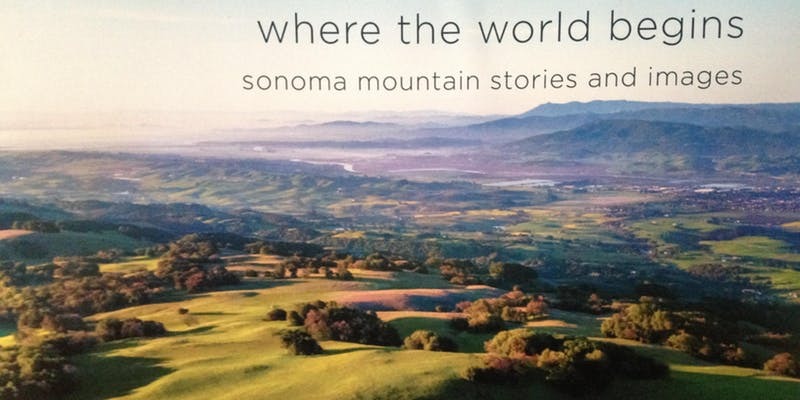 The finished product features dozens of eye-popping photos, maps (made by Sonoma Ecology Center mapmaker Alex Young), and personal stories and insights on Sonoma Valley’s most iconic mountain. The book was published last month by Sonoma Mountain Preservation as part of that group’s 25th anniversary celebration. “Where the World Begins” is available online at www.sonomamountain.org, or at Readers’ Books in Sonoma and Copperfield’s Books in Sonoma County, or at any of the upcoming book launch events. We will be taking part in one of those events – at Vintage House on Wednesday, April 3, featuring “personal stories by photographers Ed Cooper and Richard Dale” and “a dive into mapmaking with map wizard Alex Young.” See you there!